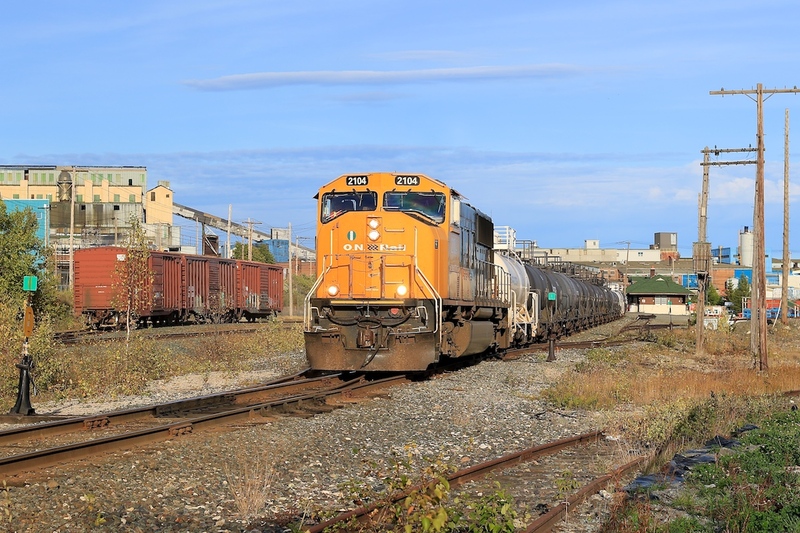 Railpictures.ca - Craig Allen Photo: ONT 2104 is working solo today as it pushes back a long cut of tank cars into Glencore’s Horne Smelter complex. The cars are headed over to the acid plant where they will be filled with sulphuric acid that is produced during the copper smelting process. To the right is the old Noranda station, built circa 1925. | Railpictures.ca – Canadian Railway Photography – photographie ferroviaire Canadienne. Caption: ONT 2104 is working solo today as it pushes back a long cut of tank cars into Glencore's Horne Smelter complex. The cars are headed over to the acid plant where they will be filled with sulphuric acid that is produced during the copper smelting process. To the right is the old Noranda station, built circa 1925.